Hi everyone Deb here with an update on one of our magnifying mirror models. The design of this scissor arm magnifying mirror has been around for many years and reminds us of something you would find in the grand old hotels of the 20's. The standout design feature of this mirror is the scissor arm action that allows it to extend out from the wall. Jerdon have gone away from the 4x magnification and upgraded it to a 7x magnification. The new model designation is now 2027C. That's a very good mid-range magnification in a large diameter mirror. This wall mounted model will extend out from the wall further than any other model on the market and with a reach of 60cm. The wall mount bracket has sufficient strength also to allow the mirror to move or swing from left to right 180 degrees. To add to the versatility the mirror itself is double sided and by simply turning the mirror itself you can have either 7x magnification to get close up on what you're doing or 1x to just check everything is in order before you leave. There has been a trend of late where customers like to mount their magnifying mirror inside a cabinet. With that in mind and in terms of a space requirement the scissor arm magnifying mirror will fold back flat against the wall with the overall dimensions being 41cm high and 235cm. These are the highest and widest points. We are not really sure of the reason however it's this model that gets continually mounted inside shower cubicles and so a word of warning do not mount the mirror inside the shower cubicle. The mirror is made from glass and a real chance of shattering should hot water hit the surface or you slip and grab for the mirror on instinct. Not only that the metal scissor arm will rust. Chrome, Gold, or Brass plating will not prevent steel from rusting. Lots of enquiries coming through the phone of late regarding stock and delivery times. It worth repeating here at My Health and Beauty the team go out of their way to be as fast as possible from the time you order till you receive your order. We know other online sites are not as particular on this point. We are reliant on Australia post and Star Track who are reasonable most of the time. Other times they can be shocking including this week alone it took 3 times for customer to get her mirror with the first one arriving smashed after something heavy was dropped on it. We replaced it only to find the second never arrived at all and is still lost and the third unit has been sent and arrived safely in one piece. 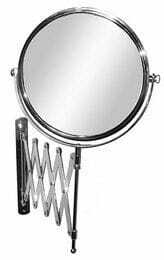 For those enquiring if we have stock, if you can see a magnifying mirror on our site it is in stock when we reach zero stock the item comes off the site meaning you can't see it until restock. Once again we know there are many sites who will sell anything, take the money and apologize later this is not best practice and only pushes customers away from online purchasing. Finally let me say that you can feel much more comfortable when a phone number is given and you can actually talk to somebody. I know our liaison person Greg does a great job and answers all manner questions to help the customers. I guess that's a great check point for you the customer is if the site has no phone number to ring to talk to somebody or if it's an overseas site with no chance to ask a question then maybe you might be better off avoiding them. Thats all from me today . Remember to keep smiling and just do the best you can each day.